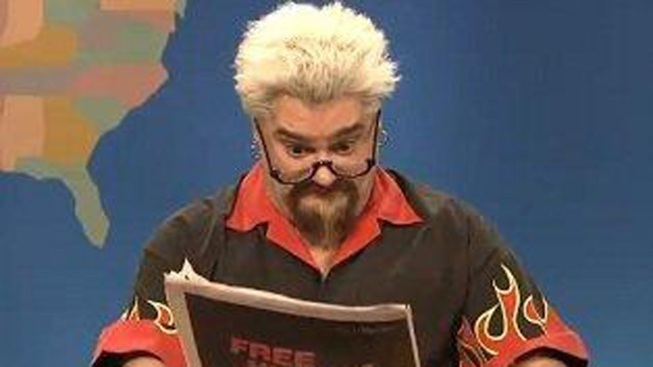 "Saturday Night Live" releases the Guy Fieri sketch that didn't make the cut on Saturday's show. "Saturday Night Live's" Bobby Moynihan reprised his role as Food Network star Guy Fieri, who made headlines last week when the New York Times crucified Fieri’s new restaurant. The sketch didn’t air on Saturday’s show, but NBC released the dress rehearsal video which imagines Fieri reading Pete Wells’ review for the first time. "Oh, no! That's not off the chain," Moynihan-as-Fieri said. "That's very much on the chain." The review left the typically full-throttle host of Diners Drive-ins and Dives feeling "pretty half-throttle." "I've never felt sicker in my life, Seth," the faux Fieri said. "And keep in mind all I eat is bacon bombs, which is bacon wrapped in dynamite!" The would-be Fieri’s disappointment turns into mockery when he questions the New York Times' decision to review his restaurant in the first place. "I mean, I wear flames on my shirt and I don't bleach my roots. That doesn't exactly scream haute cuisine. It screams, 'Look out, a maniac is about to hit you with a face full of donkey sauce,'" he said. The sketch parodies the Times review, which made headlines last week for its sarcastic questions about the food and service at Guy’s American Kitchen and Bar. Fieri fired back on the “Today” show on Thursday, calling the now-infamous critique “ridiculous” and suggesting “another agenda” was behind it. Moynihan’s Fieri comebacks were more blunt.